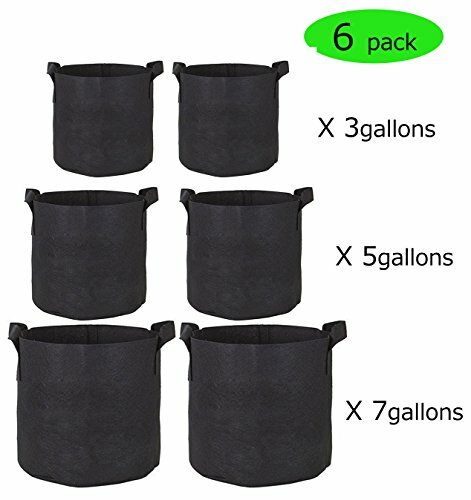 3 Gallon/5 Gallon/7 Gallon Grow Bags- 6 Pack Reusable and Durable Fabric Aeration Pots Container with Strap Handles, Perfect for Nursery Garden and Planting by F-sport at Tulips Orchids. MPN: 43217-60696. Hurry! Limited time offer. Offer valid only while supplies last. WHY DO YOU CHOOSE OUR GROW BAGS?Our Grow Bags are perfect for growing fruits and vegetables and well as ornamental plants around the house. WHY DO YOU CHOOSE OUR GROW BAGS? Our Grow Bags are perfect for growing fruits and vegetables and well as ornamental plants around the house. Provides aeration, enhancing roots structure, allows roots to breathe, boosts plants growth and yields, is the best choice for your plants. What do you think of it? Thank you for your time, hope you enjoy it. Made of high quality non-woven fabric, wear-resisting, highly tear resistant, can last for many years in all weather conditions. Reinforced sturdy straps with double stitching are used for safe transport. Easy to transplant, decreased risk of transplant shock. Provides aeration, enhancing roots structure, allows roots to breathe, boosts plants growth and yields. Provides stable growth environment for plants, keeps plants warmer in winter and cooler in summer. Suitable for balcony garden, home furnishing, home gardening, shopping mall, nursery nurturing and hotel, etc. Choose the bag according to the 6 times of the plant diameter. Put the prepared soil in the bag to fill 1/3 of the plant pot bag. Put the plant in the middle of the bag and continue filling soil. Watering when you filling and finish filling until 3 - 5cm to reach the edge. Adjust the plant spacing and angles according to the habits of plants. [QUALITY MATERIAL]: Made of high quality non-woven fabric, better than plastic container. Soft, portable, sturdy, reusable and environmental-friendly. [DIFFERENT SIZE]: 3 Gallon: 10 × 9 inch, 5 Gallon: 12 × 10 inch, 7 Gallon: 13 × 12 inch (Diameter × Height). [WARMER & COOLER]: Keeps plant warmer in winter and cooler in summer. Provides aeration, enhancing root structure, allow roots to breathe and grow healthier, boosts plant growth and yields. [EASY TO TRANSPLANT]: Reinforced sturdy straps with double stitching are used for safe transport. Decreased risk of transplant shock. [APPLICATION SCENE]: Balcony garden, greening works, home furnishings, home gardening, shopping malls, nursery nurturing and hotel, etc. If you have any questions about this product by F-sport, contact us by completing and submitting the form below. If you are looking for a specif part number, please include it with your message.